Here's the latest book in my Grab & Go series. These are repeated posts about books that lend themselves to a super easy lesson because their content directly relates to biblical traditions or spiritual ideas. 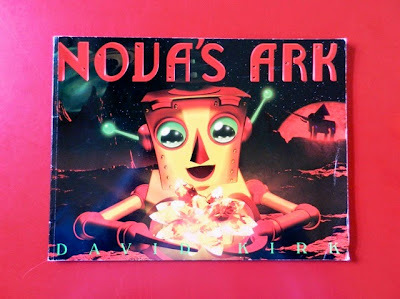 Summary: While playing with his family’s ancient treasure, a wooden ark and a set of wooden animals, Nova, a robot boy, misses his father who is on a space mission. Later, he accidentally rockets himself to a new planet (Nova is an engineering genius!) and uses his amazing talents to invent new mechanical animals to keep him company. After being reunited with his father who is injured, Nova & each animal sacrifice a component of their mechanics to save his father. Eventually father & son discover on this new planet the energy source that their planet desperately needs. Hanna’s Comments: There is a great deal to talk about in this story. Encourage discussion among older listeners about connections between this tale and the biblical ark story. Ask about why this old story has various versions in cultures and media. What message does the old story (and this new one derived from images of that old story) have for us today? Younger listeners will simply enjoy the story and help you find connections to Genesis. Idea(s) for Application: Read this book to children, youth, or adults to explore the power and themes from the biblical story of Noah’s ark.